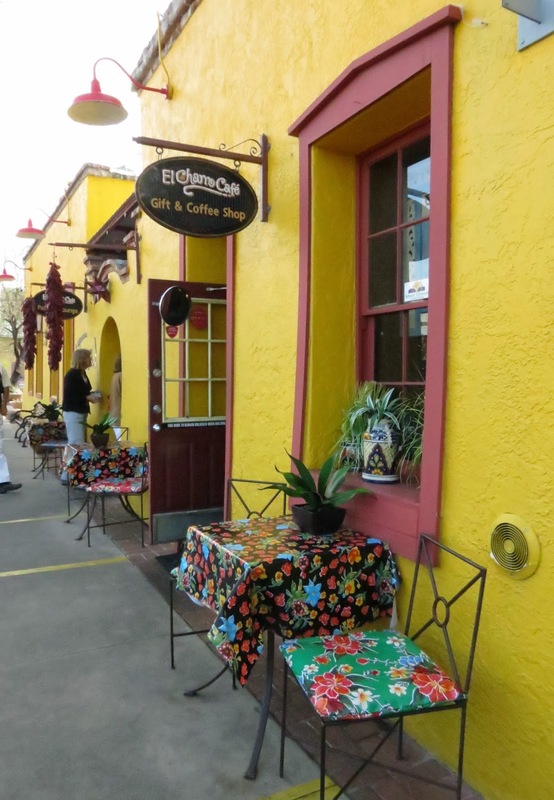 This walking tour of an old Tuscon neighborhood (Barrio Viejo) was developed by the Arizona Women's Heritage Trail. It sounded unique and interesting, so we did it. The tour begins at the Convention Center. We had to find and follow this blue line to our first stop. Named after the 3 families who lived here, the Sosa-Cariilo-Fremont House is one of Tuscon's oldest adobe residences. Built in the neighborhood formerly known as Barrio Libre, the house was the center of domestic life for women from the Sosa (1850-1878) and Carillo (1878-1965) families. Elizabeth Fremont, daughter of Arizona's Territorial Governor, also lived here briefly in 1881. In 1965, when the city cleared the area for the community center, the Tuscon Heritage Center led efforts to save and restore the building, which is why it is still here on the Convention Center grounds. From the Convention Center we could see these two hills and the following signs that tell some history about them. Maintained by Hispanic women, this site has been a place for prayer and reflection in Barrio Viejo for more than 120 years. The community's resolve to save the shrine in 1971 prevented the construction of an expressway that would have cut through three historic neighborhoods. Thereafter, the legislature put a moritorium on inner-city freeway projects in the state of Arizona. 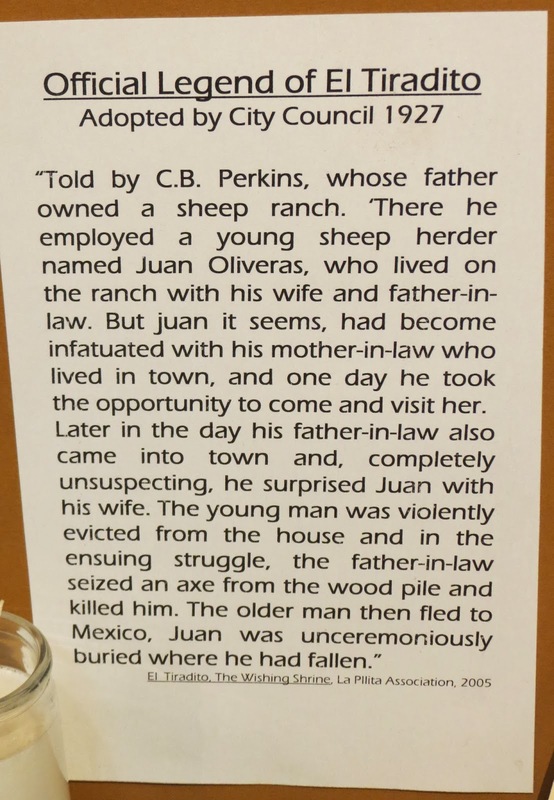 We saw another historical marker next door, so got side-tracked again and discovered this wonderful little museum. The docent came out and persuaded us to come in for a tour. We learned a lot about the history of the neighborhood. 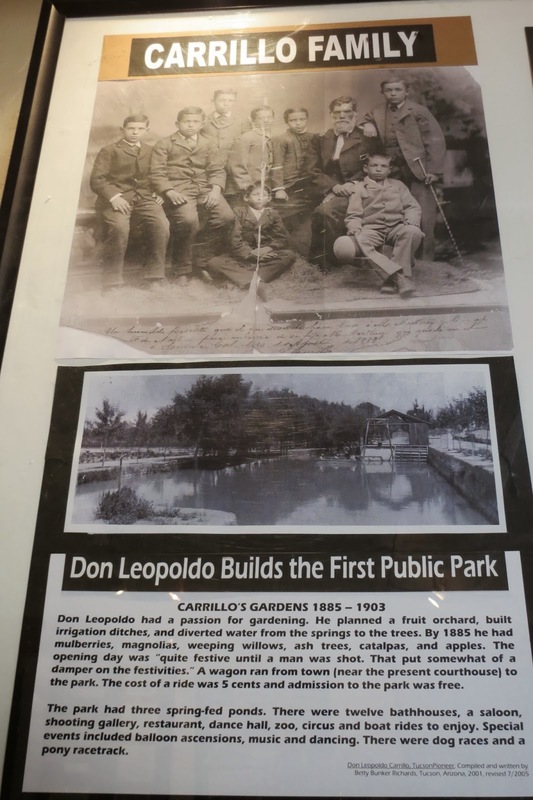 The Carrillo family was responsible for a lot of growth in the barrio. He created the first public park, and many other forms of amusement. Outside are what remains of the old springs and gardens. I love all the colorful murals. Emanuel Drachman purchased the gardens in 1903 and expanded the park. Mule drawn trolley that carried passengers to the park. The flowers are still lovely. Not part of the tour, but I liked this colorful restaurant on the corner. Stop #3 is the former residence of Theresa Marx Ferrin. 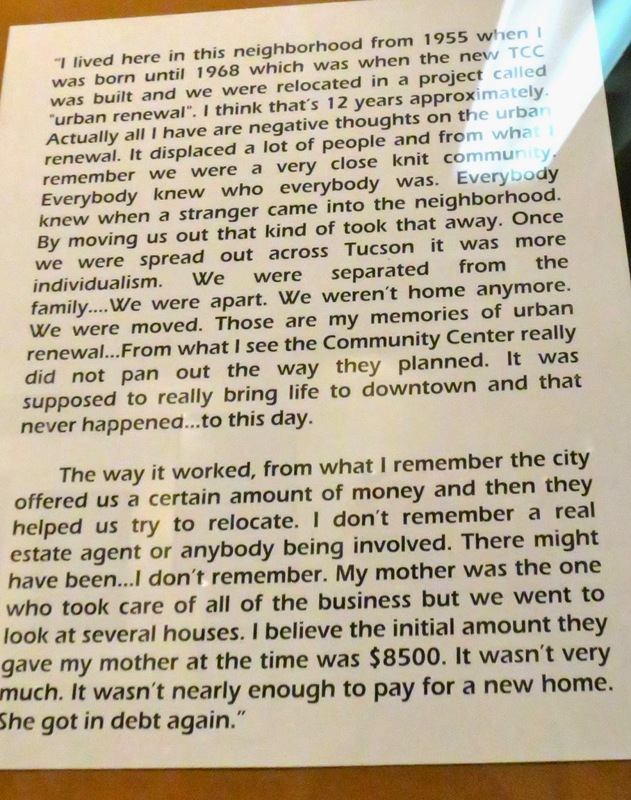 She and her family lived in the back of their store. Theresa became known as the "angel of Tucson" through her work as a practical nurse and herbalist. She assisted Dr. Handy, Tucson's only doctor at the end of the 19th century, and also cared for patients individually. Now her home is known for Jazz! Looking down the street toward stop #4, El Teatro Carmen. 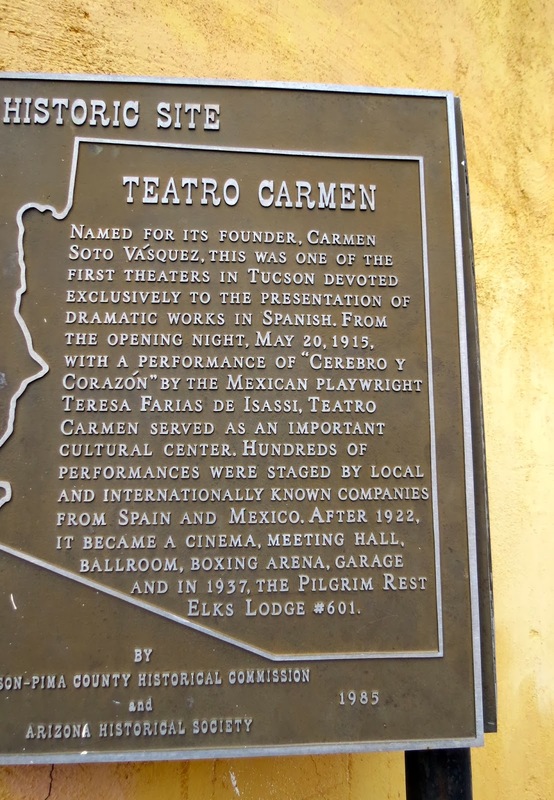 Carmen Soto de Vasquez founded this Spanish-language theatre in Barrio Viejo. It became the most elegant theatre of its era from 1914 to 1922. Stop #5 is the former "Four Corners" Chinese Markets. Fok Yut Nogan immigrated to Tucson in 1906 as a young bride. She and her husband ran one of these groceries and a bakery here. She worked in the store becoming proficient in both Spanish and English while also raising a family of 10 children. Immaculate Heart School and Convent: Catholic nuns taught school at this site for about 100 years, starting in 1885. They lived in the convent in the back. In 1986 the building was converted to loft apartments. They are renting now, if you're interested. Not part of the tour, but a neat old hotel anyway. #7 The Temple of Music and Art opened in 1927, thanks to the efforts of Madeline Heineman Berger and other women from the Saturday Morning Music Club. Their fundraising efforts created this cultural center which has showcased world-renown musicians. It has an auditorium which seats 1000 people, and has a stage large enough for a full symphony orchestra. It is operated today by the Arizona Theatre Company. Beautiful flowering trees line the streets. St. Augustine Cathedral catches my eye as we pass. We come to "La Placida," a collection of colorful shops and offices that are the result of urban renewal in the 1970s. They are built on the site of Barrio Viejo, the old neighborhood that was torn down to "improve" the town. I noticed a lot of the shops are empty, and those that were not, were closed today. The Visitors Center was open. In the middle is this tiny park, all that remains of the plaza that was once a gathering place for the Mexican American community for more than 100 years. 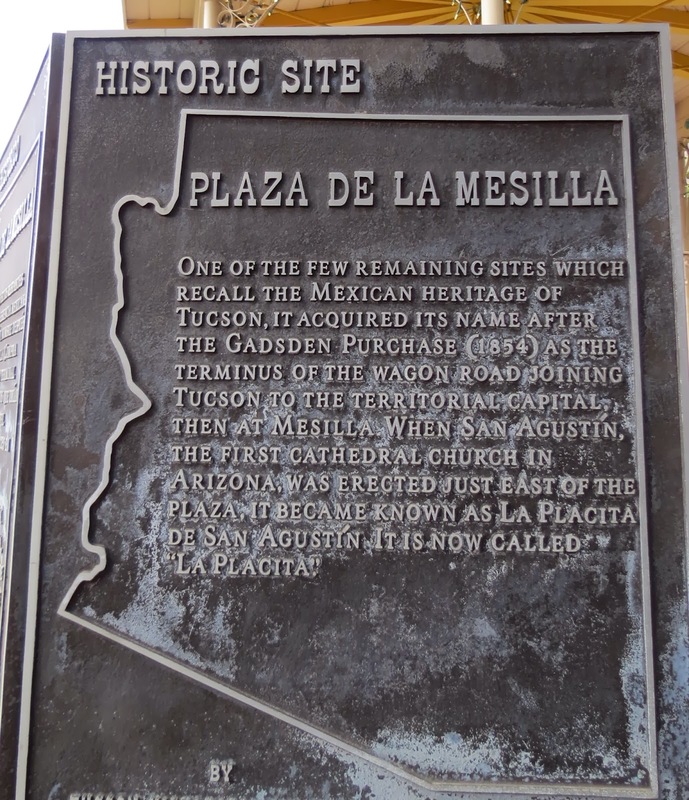 The Placita Committee, comprised of mostly women, managed to save a small remnant of it here. Photographers were taking pictures of pretty ladies in the park. Even the parking garage is multi-colored. We drove a few blocks to complete the rest of the walking tour. We passed the Pima County Courthouse, built in 1929. We ate in a Mexican restaurant at our last stop, but this wasn't it. This corner was the location of the northwest corner of the adobe wall which surrounded the Spanish Presidio in the late 1700s. Stop #9: Former residence of Atanacia Santa Cruz Hughes. Santa Cruz was born in 1850, lived and raised children in early Tuscon, first when it was part of Mexico. Later she married an American, Sam Hughes, and aided the town's development. Today her home is a series of garden apartments. One section of the old Presidio has been restored. 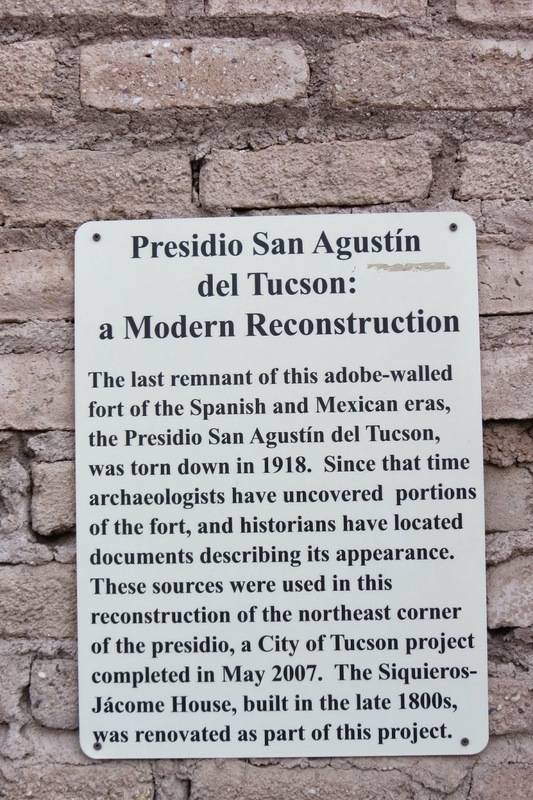 Tucson's oldest historic site, the Presidio is a military garrison dating back to 1776. Women from Spain and Mexico kept house, cared for families, and socialized in this fort. Stop #11: The Stork's Nest was a maternity home for Tucson women from the 1920s to the 1940s. Operated by Helen Jacobs, nurses staffed it day and night. 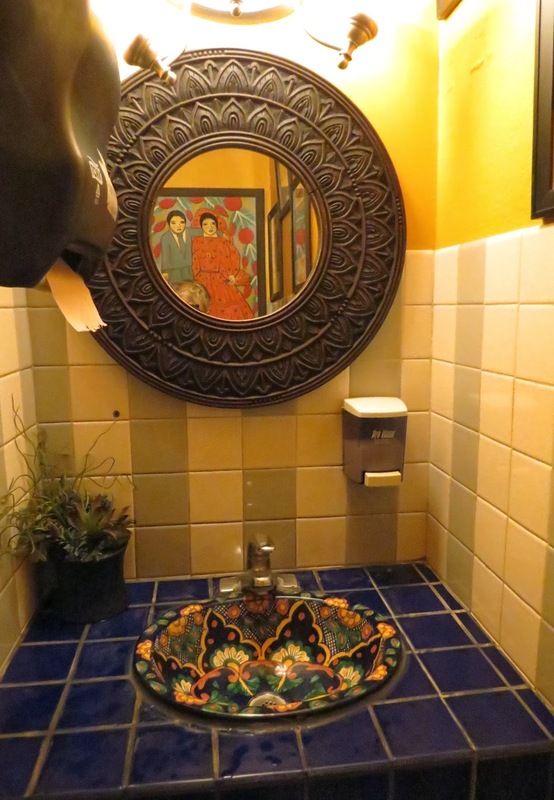 Our last stop was El Charro Cafe. Monica Flin opened the first cafe in 1922 after her second husband died. The cafe has had 3 locations before its current one, which was originally the Flin family home. You can eat inside or in the garden. El Charro "Down Under" refers to the submarine USS Tucson, which named its galley "El Charro Down Under." Had to take a picture in the ladies restroom too. Beth taking a picture of her food. More art as we make our way out of the city. Is that snow on that car??? We got a little lost, but saw some Gambel Quail crossing the road, so it was ok.
We are free camping again in a BLM (Bureau of Land Management) campground just outside of Tuscon.